Valeant Pharmaceuticals International Inc. (VRX.TO) is on a tear, trading at its highest level since September 2016 after winning over another sell-side analyst. 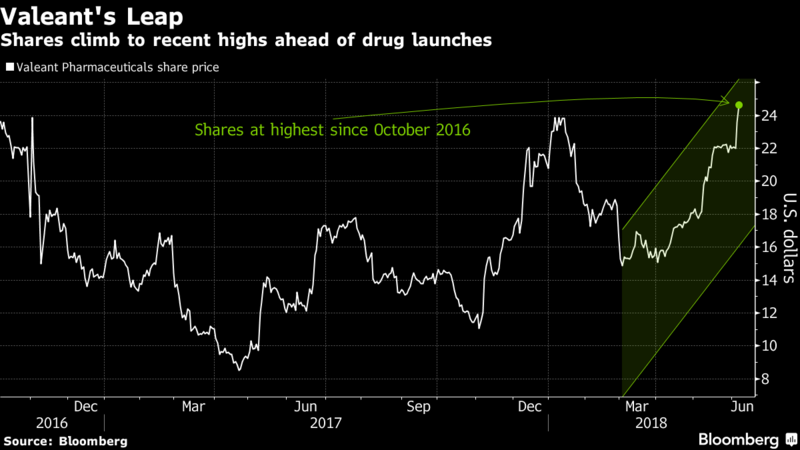 The former favorite of Pershing Square’s Bill Ackman has reached an inflection point, according to Barclays analyst Douglas Tsao, as its existing business offers a “foundation for the company to enjoy growth” driven by the introduction of a trio of drugs. Tsao upgraded his rating on the stock to overweight from equalweight, saying “blocking and tackling” within the business should help grind out incremental profitability on top of revenue growth after strong earnings last month. The Bridgewater, New Jersey-based pharmaceutical company expects to begin selling three drugs -- Duobrii, Bryhali, and Altreno -- this year with more to come in 2019 and beyond. While none of the drugs are expected to be immediate “blockbusters,” successful introductions will be key to Valeant’s turnaround, given heightened investor focus on the company’s dermatology business after a recent overhaul, Tsao wrote. Valeant isn’t alone in today’s rally. Shares of drugmaking peers Endo International Plc and Mallinckrodt Plc are having their best days in about a month. The stocks are continuing to dig out of recent craters spurred by comments from the Trump administration. The Bloomberg Intelligence BI Global Specialty-Generic Pharma Competitive Index is on-track for its best close since January. Mizuho analyst Irina Koffler called the drugmaker’s portfolio “Mylan-like,” considering its revenue is primarily driven by stable consumer-focused products. Shares have rallied more than 60 percent in the last two months, as the continued turnaround and recent debt reduction continued to gain steam and win over analysts and investors alike.